SUR-FIT Natura Flexible Skin Barrier with rounded edges for a more comfortable fit, low profile flange and split-release paper backing for easy application. The cut-to-fit opening eliminates the need for cutting the skin barrier/wafer and accommodates those people with limited manual dexterity. 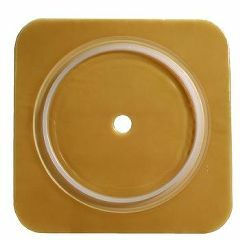 Available in two flange sizes and 11 cut-to-fit openings to accommodate most stoma sizes. I believe this listing has the size and flange size reversed?